Care handbook which covers all aspects of caring for your new bonsai. Free delivery on all products to most areas of the UK. Please choose your delivery date at the checkout. Hands on bonsai pruning kit! This set is the perfect way to get started in the amazing art of bonsai, complete with step-by-step guide and online bonsai tutorial videos. The Chinese Elm (Ulmus parvifolia) makes a truly beautiful bonsai with small bright green leaves. The tree has excellent twig structure and has great character throughout, making it the perfect representation of a woodland tree. In our opinion the Chinese Elm is the most perfectly proportioned, easy to care for and adaptable tree and makes a superb bonsai; which can be grown either indoors or outdoors. This variety of bonsai is superb for a beginners starter bonsai, it is fun to grow, style, prune and repot and grows relatively fast and is easy to care for. 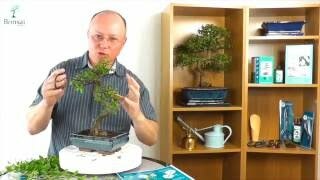 A fabulous bonsai which is perfect for beginners!